Wood Retaining walls are an affordable, attractive way to retain topsoil from washing away down a slope. Retaining walls can be turned into a terraced garden for planting anything from vegetables and flowers to small shrubs and trees. 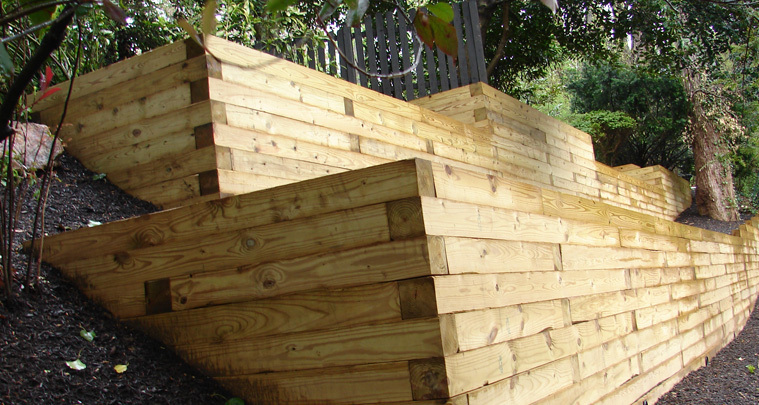 We at Capital Fence use 6×6 pressure treated pine for the majority of our retaining walls constructed. Check with your community’s permitting and zoning office before setting out to build a retaining wall. Montgomery County, MD requires a building permit for any retaining wall over 54 inches in height. See our Permitting Information for further details.